See this Holmes page for further details of the later Holmes. William Holmes was born in Worcester to John Holmes and Susannah Probert, who married at Claines in Worcestershire on 27th Sep 1812. Susannah has not been traced, though there are other Proberts around the Worcester area after this date. 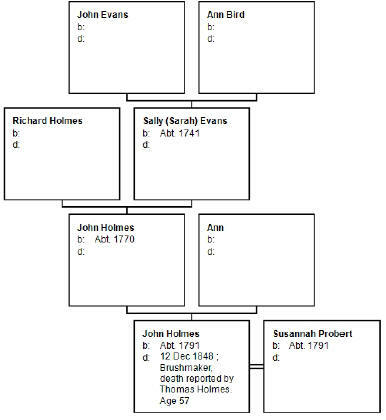 After comparing a number of baptisms on Familysearch and The Genealogist, it seems clear that for correct birth date and closeness to this marriage, that John Holmes was baptised on 23rd January 1791 to John Holmes and Ann. It also seems clear that he had one sister, Jane baptised on 9th November 1788 at nearby Dodderhill. There are also some later baptisms at Bromsgrove, including a John Holmes baptised in 1794 aged 3 (Remember that the above William Holmes was baptised twice, in Worcester and Birmingham, so it does happen). However in the absence of supporting evidence I will omit the Bromsgrove records. No marriages have been found for John Holmes and Ann, the only ones being too far away to be likely. John Holmes the father was baptised at St Andrew's Droitwich to Richard Holmes and Sally Evans. Richard and Sally were married (as Richard and Sarah) on 11th August 1765 at St Andrew's. Nancy Holmes born apparently in St Nicholas (Droitwich) but baptised 27th June 1766 at St Andrew's to Richard and Sarah. Thomas Holmes baptised on 27th December 1770 at St Andrew's to Richard and Sally (all subsequent records call her Sally). John Holmes baptised on 27th December 1770 at St Andrew's, probably a twin.  Elizabeth Holmes baptised on 27th March 1772 at St Andew's. This is tentative as yet.